The Valletta Green Festival features the infiorata in St George’s Square, which is this year dedicated to the Presidency of the Council of the European Union. The gardens at St Catherine’s Monastery and the underground cisterns at the Archbishop’s Palace will be open to the public during the weekend of the festival (28th-30th April) from 9am-noon and 4pm-7pm. The annual Valletta Green Festival organised by the Valletta 2018 Foundation opened earlier today and will be running till the 30th April 2017. 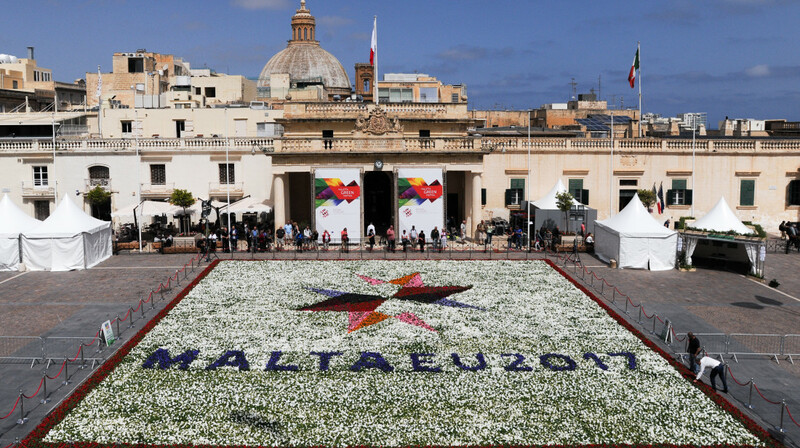 As with previous editions, the Valletta Green Festival features the infiorata for the duration of the festival in St George’s Square, which is this year dedicated to the Presidency of the Council of the European Union. The gardens at St Catherine’s Monastery and the underground cisterns at the Archbishop’s Palace will be open to the public during the weekend of the festival (28th-30th April) from 9am-noon and 4pm-7pm. The Minister for Sustainable Development, the Environment and Climate Change José Herrera said “The Ministry is paying special attention to conserve and preserve parks and in fact, the Parks Department, the Environment and Resources Authority and WasteServ are very much involved in the success of the Valletta Green Festival. A total of €30,000 is being invested in the greening and cleaning of our communities”. Valletta Mayor Alexiei Dingli spoke about the importance of investment in greening urban spaces. Discussing the water cistern at the Archbishop’s Palace, Prof. Dingli said the Valletta Green Festival is an opportunity for debate on the importance of water as a limited resource and therefore its protection. Environmental Landscapes Consortium Chairman Peter Calamatta highlighted this is the fourth year the flower carpet has been set up in Pjazza San Ġorġ to the satisfaction of a small team of workers who worked tirelessly during the night to transform the space. This year’s Valletta Green Festival is being enjoyed by a wider international audience due to the EU Environment Ministers’ meeting as part of the Maltese Presidency of the Council of the European Union. As part of the Valletta Green Festival, several events are spread around the city with an Open Mic/Palk Ħieles activity taking place at the Camarata Bar on Friday 28th April at 8pm and an upcycled musical instrument workshop and performance taking place at Maori Bar on Saturday 29th April at 7pm. Storytelling activities will also be taking place in front of the Law Courts throughout Saturday and Sunday at the Valletta 2018 mobile unit. These workshops are tied to Valletta 2018’s other project Poetry in Potato Bags and will be given by Leanne Ellul, Jo Caruana and Angele Galea. A Rag Rug workshop in which old materials are upcycled into rugs will also be taking place on Saturday 29th April at 10am, led by Angele Galea. Musical acts Jackson Family Traditional Music Band and Tikka Banda will be interacting with festival goers in the square during the weekend. To highlight the festival’s environmental aspect, a sea cleanup took place on Saturday 22nd April, while a land and sea clean-up will also be taking place at L-Aħrax tal-Mellieħa on the 30th April.